"The humans who give him a forever home are in for the love of a lifetime." Duncan's face and body are covered in wounds and scars. His eyes ask only for affection. Sarah Rosenberg, community engagement manager for the LifeLine Animal Project in Atlanta, was there at just the right moment to give it to Duncan. 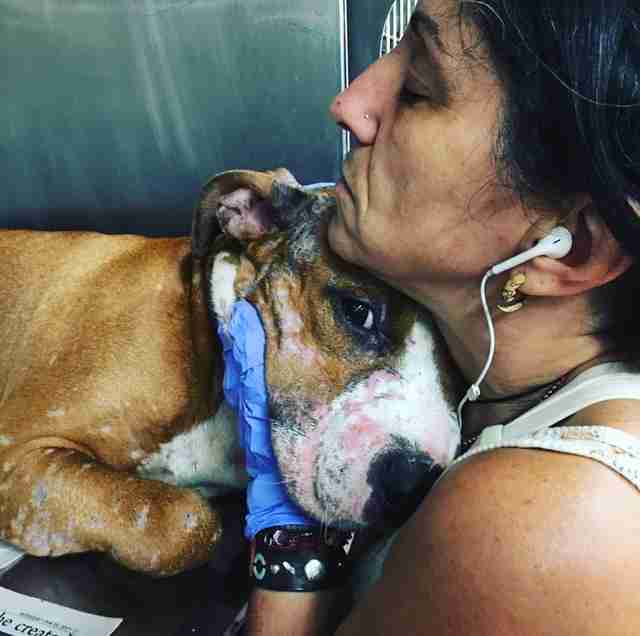 "One look at his chewed-up face and I knew he had been through a living hell, but his eyes were soft and warm and invited me to hold him," Rosenberg tells The Dodo. 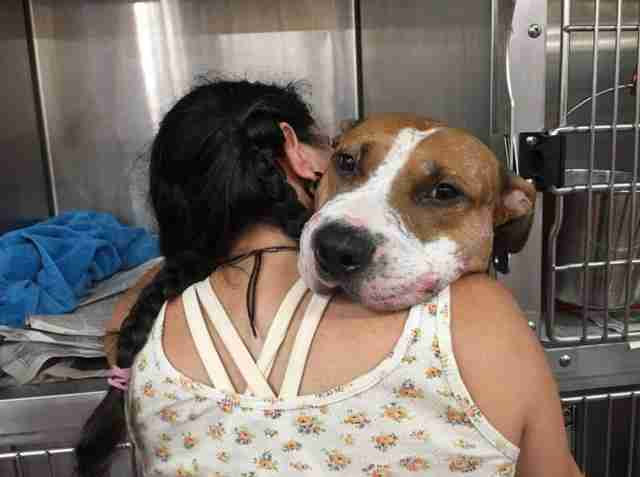 "I opened his kennel, and he melted into my arms." Duncan had been found in bad shape on a porch in Atlanta, just after Hurricane Irma blew through. An animal control officer brought him to the shelter on September 14. Duncan has a lot of old scars, as well as some fresh new wounds — and, of course, no way of explaining how he got any of them, though it seems a distinct underbite likely prevents him from protecting himself. Duncan had just arrived when Rosenberg came into work on that Thursday — it was a day that was mainly to be spent cleaning and painting, getting the shelter ready for animals who'd been evacuated. Knowing Rosenberg's soft spot for blocky-headed dogs, a colleague brought her over to meet Duncan right away. Rosenberg found herself deeply moved. Duncan seemed to feel it, too. 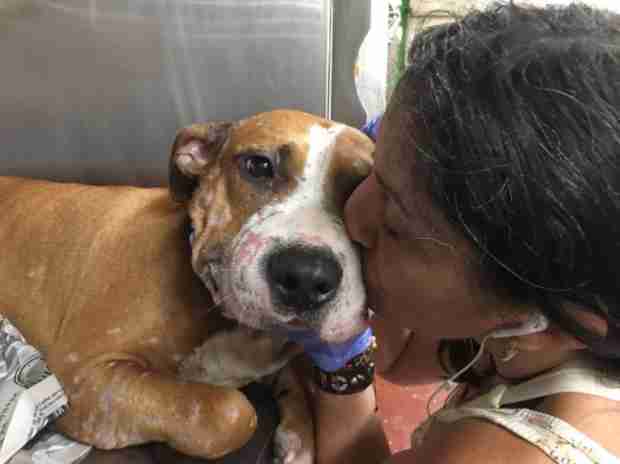 As soon as his kennel was open, Duncan tucked his battered head onto Rosenberg’s shoulder "so he could be cradled like a baby," she says. "I held him for a long time, but he held me harder," Rosenberg says. "I could tell he expected nothing but accepted everything with grace and such unbelievable sweetness." That sweetness seems to have no end. Duncan loves to be outside in the sun. He adores the children he's met. 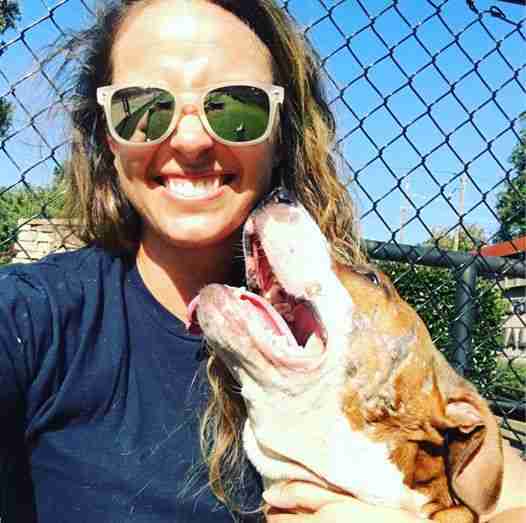 "When dogs come into the shelter that have been through abuse or neglect, they sometimes don't survive due to injuries, starvation or heartworms," Karen Hirsch, a spokeswoman for LifeLine Animal Project, says. 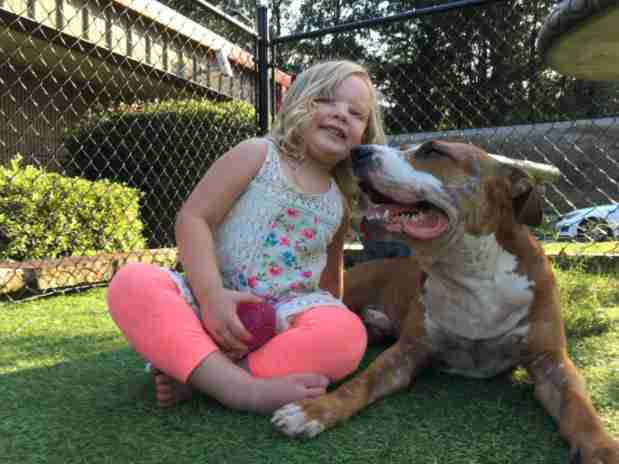 "Anytime we can show an abused dog what it feels like to be safe and loved is tremendously gratifying and makes it all worthwhile." Duncan is now up for adoption, and his rescuers know he will make one lucky family very happy. "This sweet soul has so much saved-up love to share," Rosenberg says. "The humans who give him a forever home are in for the love of a lifetime." LifeLine Animal Project has many other adoptable dogs and cats. And here's where you can donate. Update 10/2/2017: Duncan was adopted by a wonderful couple on September 26. Unfortunately, less than a week later he died of infections stemming from the wounds he'd been found with. Duncan died having known great love, from the staff at LifeLine Animal Project and from his family, whose time with him was far too short. Duncan's family has a GoFundMe to cover large medical expenses in his last days.